With common core in full force, we don’t do as much with money or coins in first grade as we used to. I know, I know… we are OK with that! However, we still want the kids to be able to identify coins and know how much it is worth. The good part is, we don’t have to agonize over those little ones who just can’t master this complex and abstract concept. Nonetheless, finding the value of a stack of coins exemplifies the importance of skip counting accurately and skip counting is a 1st grade skill. 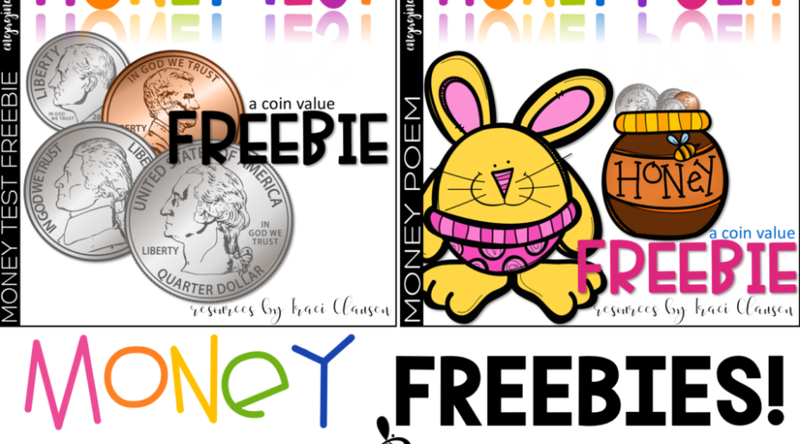 We recite our money poem a few times a week. This really seems to help cement the values of each coin. I like to use the concept of coins to help assess skip counting. This little money / coin assessment is perfect for this. You can grab both of these resources in my store. Have you ever played SCOOT! with your class? It is so much fun. The kids LOVE it! This sweet SCOOT! game is another way to practice coin identification and skip counting. I hope you and your kiddos enjoy these fun activities as much as my class does! Thanks for sharing your great products! (Also, thank you for so quickly correcting these.) Love your style! Hi, I don't see the money test in your store. When I click it, it just gives me the option to pin it.